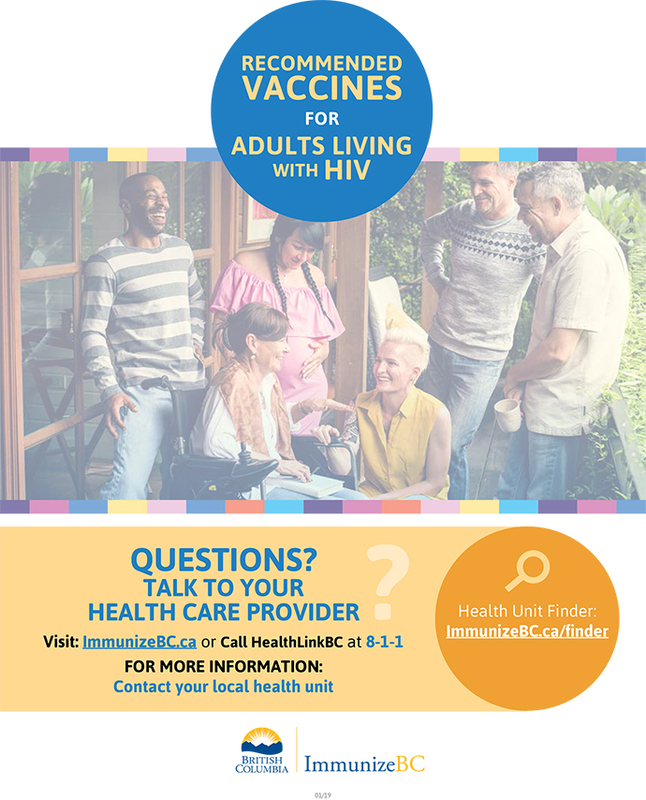 ImmunizeBC provides evidence-based immunization information and tools for residents of British Columbia. These resources can either be viewed online or downloaded and printed. Local health units may also have printed copies of the poster and pamphlet for distribution to community service providers. Audience: The public and adults living with HIV. Purpose: To inform adults living with HIV that they have specific vaccines recommendations and to encourage discussions with their health care provider. Purpose: To inform adults living with HIV about recommended vaccines that available for free or for purchase. The pamphlet answers common questions about why vaccines are an important part of health for those living with HIV. There are also links to other resources for more information about vaccines.